I don't always go to Starbucks, but when I do, I most likely will order a tall, skim milk, extra whipped cream frappuccino. I live one and a half miles away from a Starbucks, so I typically go on a long walk with my mom to get a drink on the weekends, but about two weeks ago E and I noticed that it's the perfect distance away to walk or run down to and walk back. After our run two weeks ago we arrived at Starbucks and feeling all healthy from our exercise, we decided to ditch the fraps and try something new. OMG- best decision ever. A frappuccino costs about $4 and has about 400-500 calories in a tall size, plus is has a ton of sugar in it. 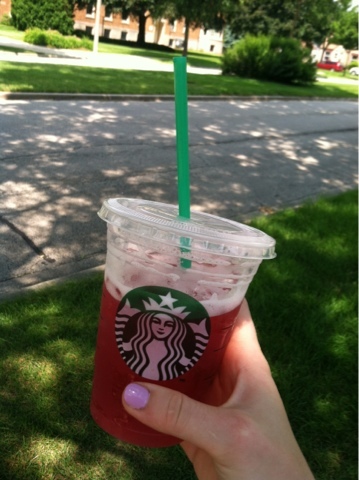 A passion tea costs about $3 and has about 100-150 calories in a grande or venti size. Do you see what I'm getting at? My new drink is now a grande, half-sweetended, iced passion tea lemonade! For a dollar less and almost 3/4 fewer calories (and quite a bit more refreshing), the tea is the way to go. I strongly recommend you all try one, you won't regret it!! It is so so so delicious and good for you and very summery and refreshing!! Have you tried the Starbucks teas? Those are my favorites! I literally have one everyday during the summer! They're so good. I love the passion tea! My mom and I discovered that Target sells tea bags of it! We now always have a pitcher sitting in the fridge! An iced nonfat chai tea latte with a pump of vanilla is one of my favorite tea drinks. Passion lemonade is quite delicious as well!